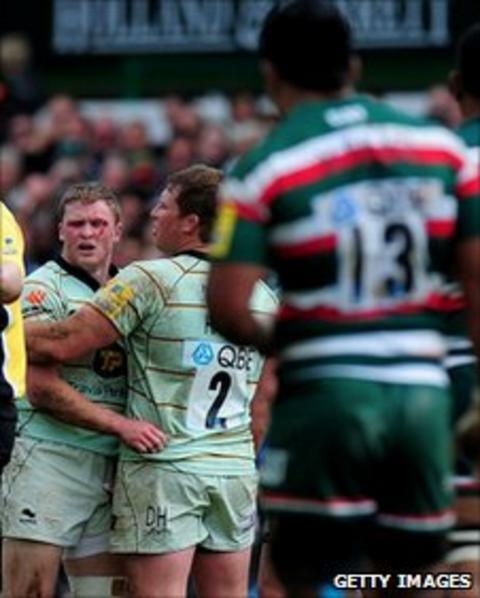 Leicester centre Manu Tuilagi will miss the Premiership final against Saracens after receiving a five-week ban for punching Northampton's Chris Ashton. The 20-year-old was initially banned for 10 weeks but his suspension was reduced in light of a push from Ashton. Tuilagi will also miss England Saxons' Churchill Cup campaign, although he is available for England's August Tests. "This sort of incident is very damaging to the image of the game," said disciplinary officer Jeff Blackett. "Had it occurred in the high street an offender would have been prosecuted in the criminal courts." Samoan-born Tuilagi has impressed in midfield this season, leading to speculation that he could win a place in England manager Martin Johnson's squad for September's Rugby World Cup. It was coming but real shame for him to miss the final, he's had an outstanding season. However he will now miss the chance to press his case in second-string matches against USA, Tonga and another as-yet-unknown side as his ban expires five days after the Churchill Cup finals day on 18 June. Both Tuilagi and Ashton were given yellow cards by referee Wayne Barnes for their parts in the incident during Leicester's 11-3 semi-final win on Saturday. However Tuilagi, who missed with two attempts to punch Ashton before connecting with a third wild swing, was subsequently reported by independent citing officer Alan Mansell. His offence, which left Ashton requiring stiches above his left eye, was rated as a "top level entry offence" by the Rugby Football Union's disciplinary panel because of the number and power of Tuilagi's blows. "However we also determined that there was some provocation from Chris Ashton who pushed and struck him in the back with his knee," said Blackett. "The top-end range is eight to 52 weeks and we determined that the appropriate entry point within that range is 10 weeks. "This was reduced by 50% to reflect Manu's youth and inexperience, his admission of guilt and his genuine remorse." Tuilagi was also ordered to pay £500 in costs. Leicester fly-half Toby Flood admitted on Twitter that he expected his team-mate to be banned, but that it was "a real shame for him to miss the final, he's had an outstanding season". Scrum-half Ben Youngs vowed that Tuilagi's absence "will just make the team even tighter". Before the verdict, Northampton forwards coach Dorian West had described Barnes and assistant Robin Goodliffe's decision to allow Tuilagi to return to the pitch as "unbelievable". "We'd have fancied our chances against them for 50 minutes with 14 men," he concluded after Leicester advanced to their seventh successive Premiership final. Tuilagi's indiscretion may allow Dan Hipkiss a return to the Leicester backline for the 28 May showpiece. A return for Hipkiss, who has largely been kept out of Richard Cockerill's side by Tuilagi's midfield partnership with Anthony Allen, would revive memories of his dramatic late try to secure victory for the Tigers in last year's showdown against Saracens. Meanwhile, Tuilagi will look towards the matches against Wales on 6 and 13 August and Ireland on 27 August that conclude England's World Cup preparations.